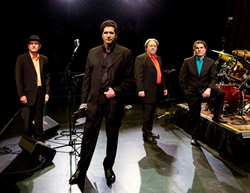 Franklin County Visitors Bureau Recommends Johnny Cash Tribute Band at Capitol Theatre in Chambersburg on April 14. Cash Tribute Band performs at Capitol Theatre. “Shaking hands with Johnny Cash is still one of the coolest experiences I’ve ever had,” said Garner. The Franklin County Visitors Bureau recommends the historic Johnny Cash Tribute at Capitol Theatre in downtown on Saturday, April 14, at 7:00 PM. Johnny Cash Tribute, led by James Garner, performed nearly 500 shows across the United States. The group even performed at Folsom State Prison to commemorate the 40th anniversary of John Cash recording a live album behind the prison walls. The show will include Cash Favorites such as “Folsom Prison Blues,” “I Walk the Line” and “Ring of Fire.” The tribute band brings the same boom-chicka-boom sound that the Tennessee Three, who backed Johnny Cash for 25 years. Rounding out the tribute band and backing James Garner is Denny Colleret, who mastered the Luther Perkins’ signature guitar sound and style; Rick Duncan on bass and vocals, and Nick Auriemmo on percussion. The audience is sure to enjoy a fun, toe-tapping trip down memory lane honoring Johnny Cash's life and music. See a preview here. Tickets are $33 for Adults, $28 for Seniors 60+ yrs., and $18 for ages 3-22. Discounts are available for groups of 10 or more people. Tickets can be purchased online here, by phone (717) 263-0202, or by visiting the box office at 159 S. Main St. in Chambersburg. “Shaking hands with Johnny Cash is still one of the coolest experiences I’ve ever had,” said Garner. Garner founded his Tribute band to bring the authentic sound and stories of Johnny Cash to audiences everywhere and to proudly present the music of Johnny Cash as fans, for fans.